Tankless Water Heaters Boulder. Operated with either natural gas or electricity, a tankless water heater uses a fraction of the energy of a traditional water heating tank. Tankless water heaters use heating elements to warm the passage of water rather than storing a limited supply of warmed water like a traditional hot water heater. Traditional hot water heaters keep a supply of hot water ready at all times. To do this, your water heater continuously uses energy to keep the water warm whether you need it or not. Tankless water heats the water only when you demand it. With these smaller on demand devices, you start the warming process when you initiate the flow of water. Cool water passes through a heating element and warms to a desired temperature before continuing on to the hot water lines. Rather than constantly warming the water, the water is only heated when you need it, turning on a hot faucet or an appliance. 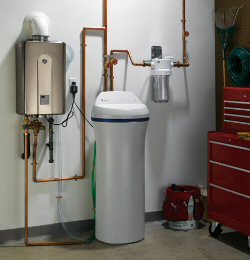 What is the best tankless hot water heater for my home? The tankless water heater recommended for your home depends on the type of energy source you have – natural gas, propane or electricity. What are the advantages of a tankless hot water heater system? Also known as a point of use water heater or an on demand water heater, this innovative product generates hot water immediately when you open the hot water faucet. The unit then turns itself off when the faucet is closed, thus saving energy costs over the entire lifetime of the unit. The energy consumed is only for heating the water that is needed for that specific time. Since there is no storage of hot water and no constant heating and re-heating of water as in standard water heaters, you’re not wasting energy when you don’t need it. The energy savings of the gas tankless water heater translates to dollar savings for you and reduced impact on our environment. Typical savings are approximately 30% of your energy usage. Furthermore, a tankless water heater produces an endless supply of hot water, provided you size the unit appropriately. Point of use water heaters are also designed to last for 20+ years and can be mounted to a wall to save space. How does an electric point of use water heater work? Same principle as the gas units, when a hot water tap is opened, the cold water enters the tankless water heater and triggers the heating elements to turn on. Your hot water tap acts as an ignition key for the energy used to heat the hot water you need. The water is then heated as it flows through the heating elements or heat exchanger. Whether you are looking for a gas or electric tankless water heaters, Planet Plumbing and Drain can help you find the perfect tankless water heater for your home in Boulder, Longmont, Broomfield, Louisville, Lafayette, Frederick, Firestone, Dacono, Erie, Gunbarrel, Superior, and surrounding areas. Call us today at 303-440-4330 for a detailed analysis of your heating needs.